We named this guy Walter, who like his namesake Walter Matthau looks like a grumpy old man on the outside but on the inside is a very loving and devoted dog. Found abandoned a few days after Christmas wondering a busy roadway he was taken to Animal Control and never claimed. As soon as he was available we were there to get this poor senior out of the shelter and into a foster home. He had a microchip but it was never registered. So we called the chip company to see who they sold it to trying to find any history or even Walters’s real name. 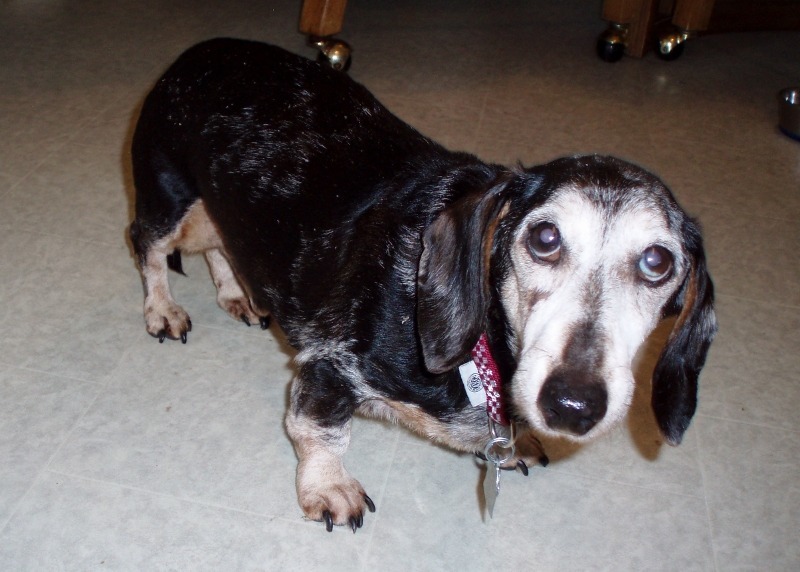 We were able to trace the chip to a breeder in Missouri who sold puppy Walter to a local Pet Store in March 2004. We then contacted a few local Vets to see if they had any records of a dachshund with his chip number but came up empty. So all we know about his past is his age 15 and Walter seems to like and has adjusted to his new name. 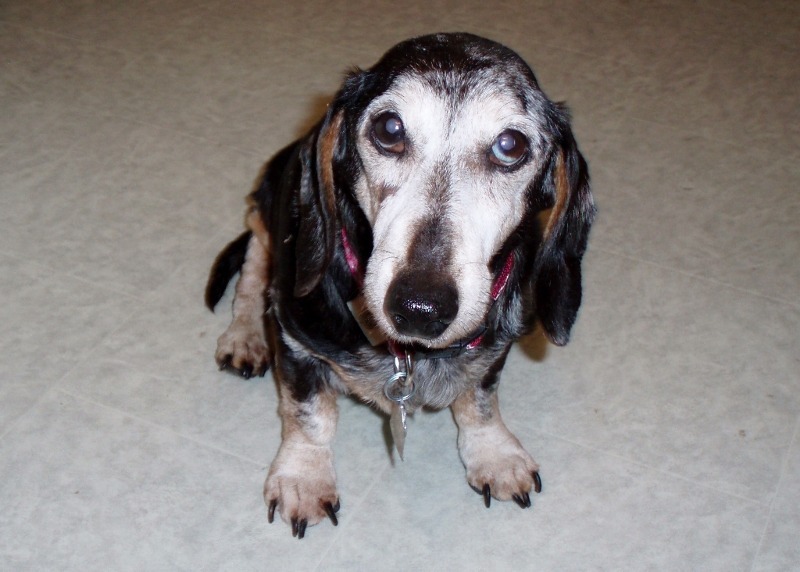 Walter gets along very well with other dachshunds of all ages. 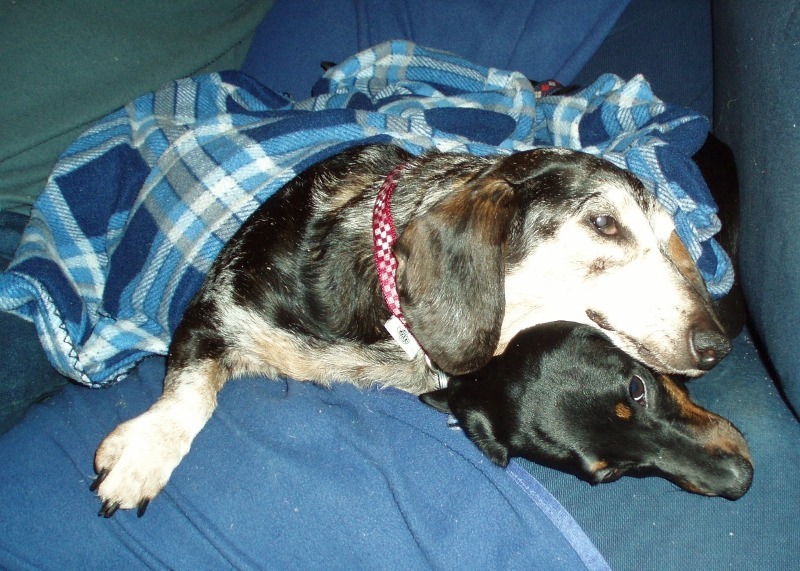 He even plays and cuddles with his 6-month-old dachshund foster sister… dirty old man??? But after seeing his behavior at the Vet …no cats … even though he would have a tough time catching one as he is not very quick on his feet. He understandably has some abandonment issue and always wants to be near a person whether at their feet or preferably on the sofa next to you. I am sure that he will become less clingy with time, trust and love as we have seen with other rescued abandoned dachshunds. Walter will bark when he needs to go outside potty and is also learning to use a doggie door. He loves anybody who will give him attention and though not tested I think would be fine with older children. For his age, Walter’s eyesight and hearing are very good but after his dental yesterday, he has no teeth (his mouth was so bad his teeth were all close to falling out). But that hasn’t slowed down this dachshunds eating one bit. And Walter requires daily medication that he takes easily in pill wrap.